Panathinaikos Athens advanced to the Turkish Airlines Euroleague playoffs from Top 16 Group E by downing Unicaja Malaga 69-60 in front of 13,200 fans in the Greek capital on Thursday. Panathinaikos improved to 7-6 and locked up a playoff spot thanks to Fenerbahce Ulker’s 95-73 road loss against Laboral Kutxa Vitoria. 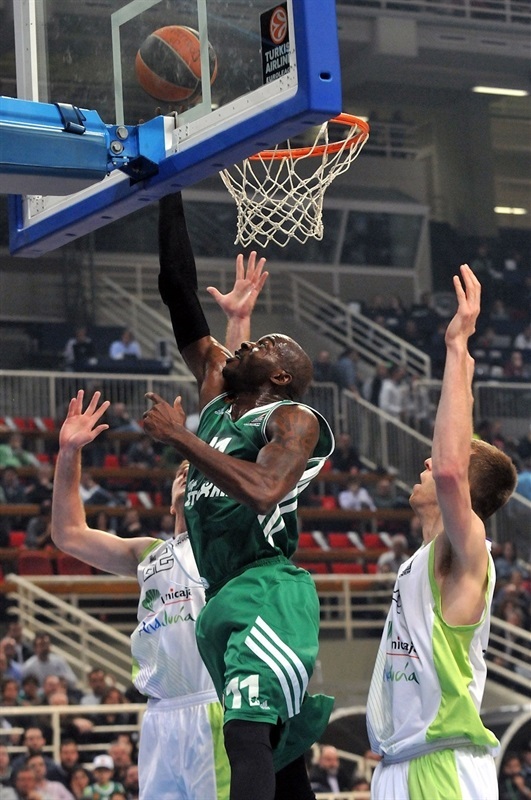 Those results also sent Panathinaikos’s archrival Olympiacos Piraeus into the next stage. 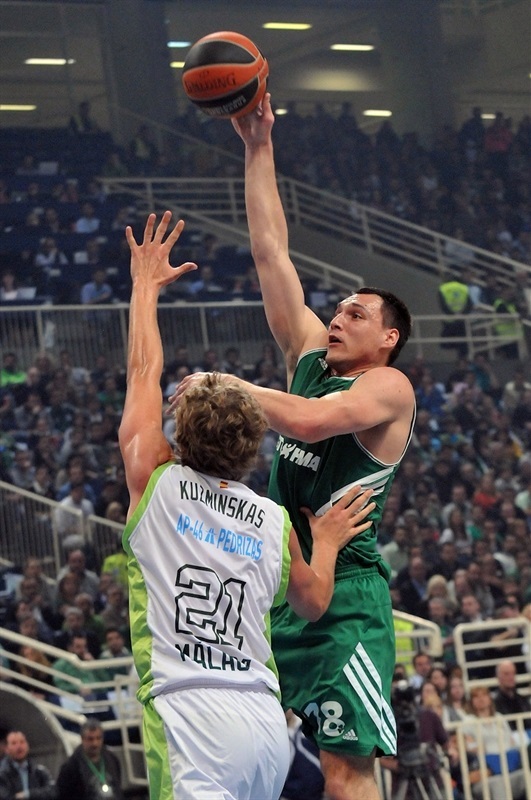 Dimitris Diamantidis led the winners with 13 points and 6 assists. 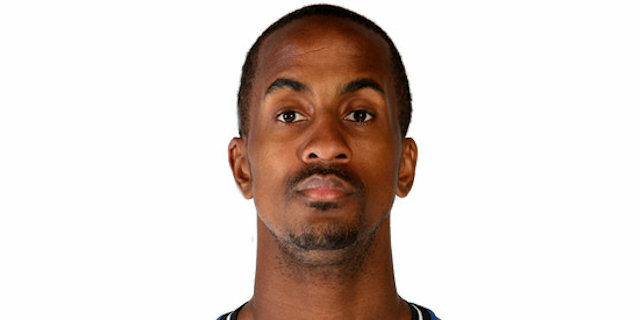 Stephane Lasme added 10 points for Panathinaikos. Vlado Stimac led Unicaja with 12 points. Back-to-back baskets by Fran Vazquez gave Unicaja an early 2-6 lead. It didn't last long, however, as Roko Ukic and Lasme fueled a 14-1 run, which Ramel Curry capped with a three-pointer for a 16-7 lead. Mike Batiste soon boosted Panathinaikos's lead to 24-12 early in the second quarter. Unicaja found a go-to guy in Ryan Toolson, who found help from Domas Sabonis to bring the guests within 33-28 at halftime. Unicaja improved its defense after the break and Stimac tied it at 37-37. Diamantidis showcase his all-around skills, as Curry and Antonis Fotsis struck from downtown in a 10-0 run that put Panathinaikos ahead for good, 47-37. The Greens improved their margin to 55-41 through three quarters and kept a safe margin throughout the fourth to cruise to a critical win. Ukic got Panathinaikos going with a one-handed floater in the lane. Mindaugas Kuzminskas took over with a put-back slam, as the guests used Zoran Dragic to prevent Diamantidis from circulating the ball fluidly. Vazquez finished a long, two-chance offense with a jumper that gave Unicaja its first lead, 2-4. Vazquez kept pacing Unicaja with a put-back layup. Lasme scored around the basket and a driving layup by Ukic tied it at 6-6. Unicaja had outrebounded the Greens 1-10 in the early minutes, but had only made 3 of 12 shots. Fotsis split free throws and a layup by Lasme gave Panathinaikos a 9-6 lead. Nik Caner-Medley made 1 of 2 foul shots before Jonas Maciulis nailed a running hook. A layup in transition by Zack Wright made it a 6-point game. Curry struck from downtown to cap a 14-1 Panathinaikos run. Txemi Urtasun and Stimac made free throws, but a three-point play by Diamantidis made it 19-10. Free throws by Carlos Suarez brought Unicaja within 19-12 after 10 minutes. Curry sank a six-meter jumper early in the quarter, as Unicaja kept struggling to score. 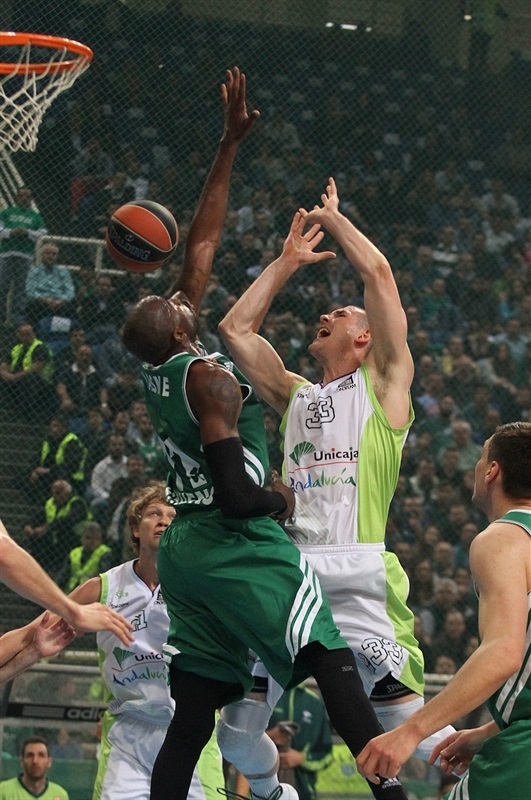 Meanwhile, a power layup by Lasme gave Panathinaikos its first double-digit lead, 23-12. 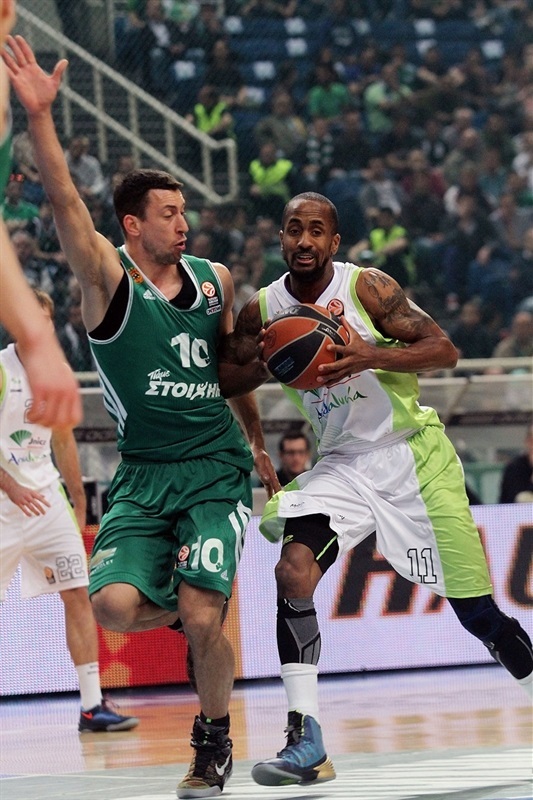 Lasme returned to the bench with 3 fouls, but the Greens kept rolling. After Batiste split free throws, a floater by Jayson Granger brought the guests a bit closer, 24-14. Ukic shined with a driving layup, but Stimac scored down low and free throws by Sabonis gave Unicaja hope at 26-18. Even though Unicaja dominated the boards, the guests missed all of their 11 three-point shots in the first 16 minutes. James Gist scored around the basket, but Vazquez answered with a layup and a three-pointer by Ryan Toolson caused Panathinaikos to call timeout at 28-23. Diamantidis and Toolson traded triples and a dunk by Batiste restored a 33-26 Panathinaikos lead. A one-handed dunk by Sabonis fixed the halftime score at 33-28. Maciulis nailed his trademark corner three-pointer immediately after the break. Suarez answered from downtown and a two-handed slam by Stimac made it a 3-point game. Unicaja was all over the place on defense, forcing the Greens to take many off-balance shots. Dragic buried a mid-range jumper off the dribble and a layup by Stimac tied it at 37-37. Diamantidis found Curry for an open three-pointer after a Panathinaikos timeout. Lasme took over with an alley-oop layup and a follow-up basket by Mike Bramos caused Unicaja to call timeout down 44-37. 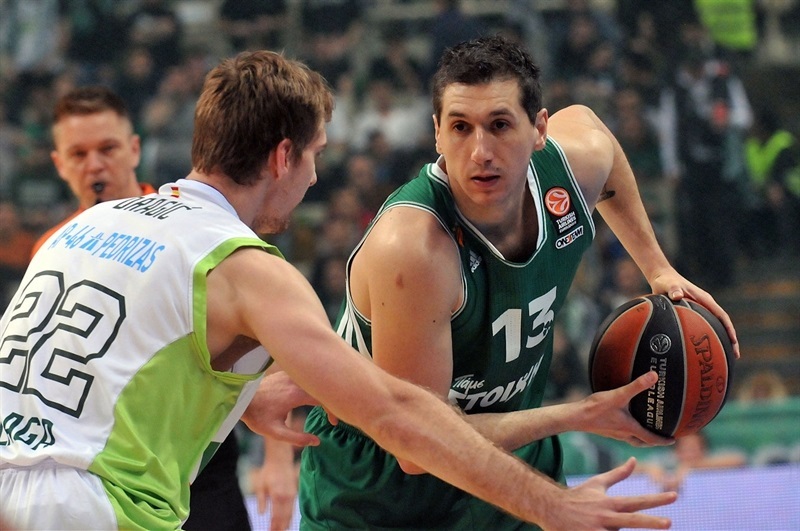 Fotsis fired one in from downtown to cap a 10-0 run, giving Panathinaikos a double-digit margin. Urtasun nailed a step-back jumper before Bramos scored again, as Panathinaikos had started to power the offensive glass. Bramos finished a three-chance offense with a corner triple and Loukas Mavrokefalidis bettered Vazquez's one-handed put-back slam with another three-pointer, good for a 55-41 Panathinaikos lead. 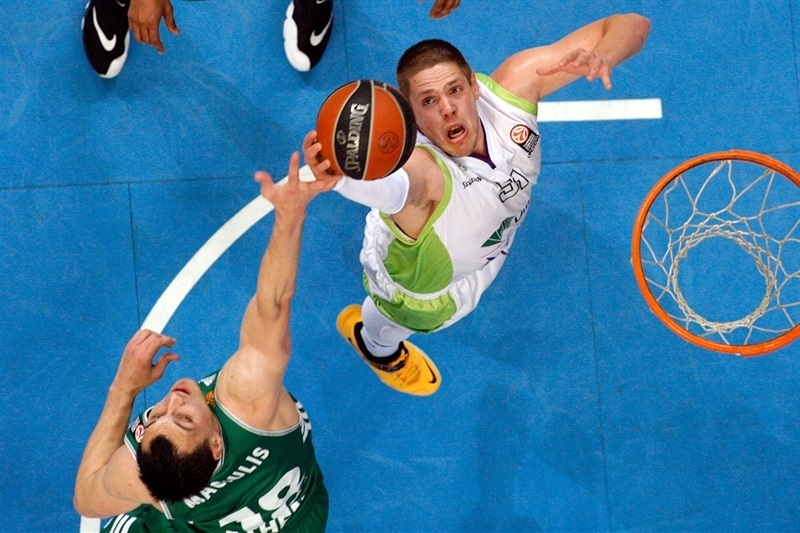 Suarez scored down low early in the fourth quarter, but Diamantidis scored again to keep Panathinaikos way ahead, 57-43. 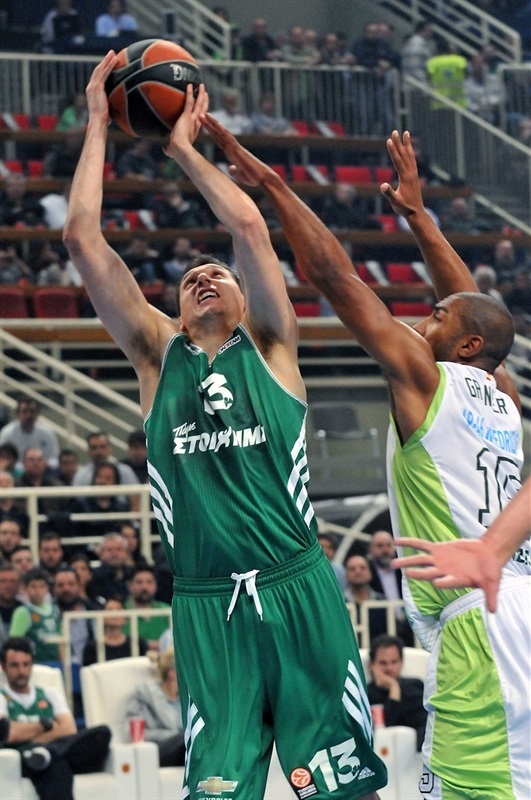 Diamantidis did even better with a three-pointer. Sabonis tried to change things with a reverse layup and a wild power basket by Gist sealed the outcome, 62-45, with seven minutes to go. Unicaja did not give up, as Granger scored in the paint, but Diamantidis ignited the crowd with a driving layup. Bramos split free throws, Granger banked in a mid-range shot and a tip-in by Stimac kept Unicaja within 65-49. 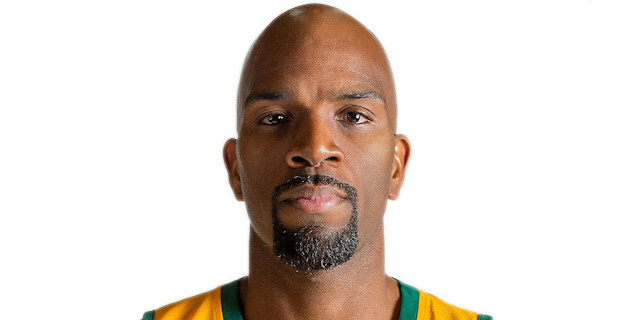 Granger hit a stop-and-pop jumper and Sabonis split free throws, but it was already too little, too late for Unicaja. By the time Lasme made free throws, everything was said and done as the Panathinaikos fans had plenty of time to celebrate their team clinching a playoff berth. "We suffered a little bit of pressure at the beginning of the game, but then the situation became much better. Our defense was the key point, but we still need to have a standard game in offense. We keep working and trying to improve our game. There is no preference of CSKA Moscow or Real Madrid for the quarterfinals. Both teams are great and played an outstanding season so far." "Congratulation to Panathinaikos on their win. We beat them in two quarters and they beat us in the other two, but the result is what counts and after all our effort was not enough. We outrebounded them and we had better percentage in the two-point shots, but we had terrible percentages from behind the arc and free throws. At the beginning of the season our ambition was to fight until the end and we almost did it. I am not the man who cries or will try to find excuses for something that didn’t happen, but I have to mention that injuries hurt us. 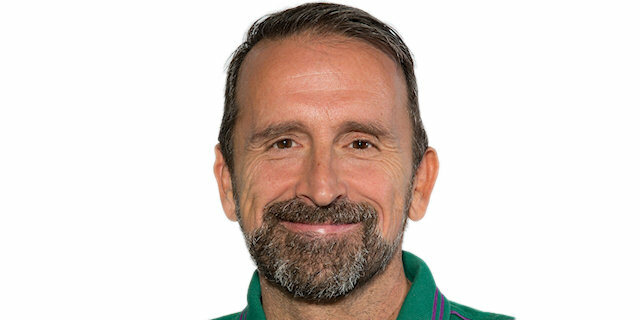 However we keep fighting, creating a new character and building another philosophy, since the team has changed four different coaches in the last years. Our motto is never give up and never surrender. If we deserve to win, I will take it. If not, then we will congratulate our opponents and it’s okay. " "I thank God for this great win. We have a great team that can play and be competitive against any given opponent in the Euroleague. Energy and intensity in defense helped us to beat them, while in offense we shared the ball and hit some great shots. Now we are in the playoffs and I don't care who the opponent will be. We have to be ready to play against them and do our best to make it to the Final Four." "We played pretty decent, but at the end they played better and beat us. The problem came from our offense, since we missed a lot of shots and scored only 60 points. We played against Olympiacos and Panathinaikos in one week and I would say that both teams are very athletic and strong."